Cris Ericson for Governor from Vermont PBS on Vimeo. A Vermont gubernatorial candidate has proposed a nationally televised show in which a booing or cheering crowd would decide the fate of state prisoners. Independent candidate Cris Ericson, a marijuana advocate who regularly runs for statewide office, outlined her vision in a commentary for Vermont PBS. “If you elect me, I will host a governor’s pardon TV show every Saturday night and pardon a few of the people who violate the new, unconstitutional anti-gun laws, and some of the nonviolent offenders of other laws, to save Vermonters money,” Ericson said in the commentary. She was referring, presumably, to new restrictions on gun ownership signed into law in April by her Republican opponent, Gov. Phil Scott. Ericson said the show would be hosted from the auditorium in Montpelier's Pavilion State Office Building, a few floors below the governor’s office. Ericson said the state could even generate revenue from the idea, by selling the show and investing the profits in the General Fund. 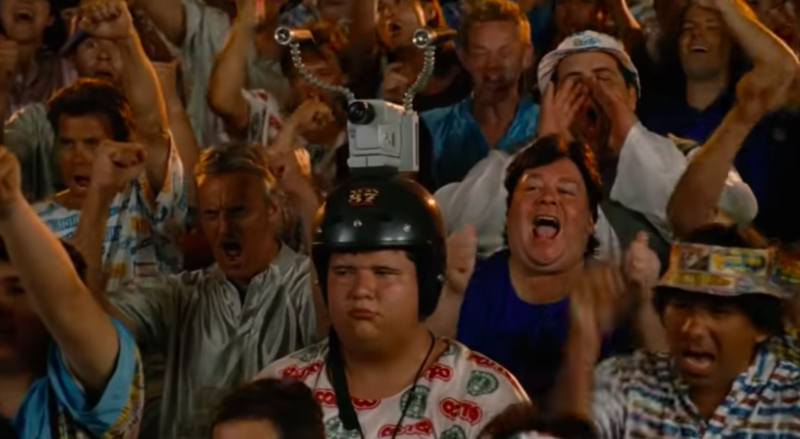 A scene from the 2006 film Idiocracy. Though she doesn’t reference the film, the scene Ericson describes bears a striking resemblance to the fictional depiction of America’s justice system in the movie Idiocracy. The film depicts a dystopian future in which capitalism and ignorance have saturated every aspect of American life, leading to a breakdown in society. The court system depicted in the film is a loosely organized form of mob rule, designed for entertainment more than fairness, with the judge serving to rile up a courtroom packed with jeering onlookers. A recent poll by Vermont Public Radio and Vermont PBS showed that Ericson had support from about 1 percent of Vermont voters.